Years ago I never would have thought that I would be eating pumpkin this way today and loving it. Pumpkin was something that I grew to love in different ways: Pumpkin choka with Sada Roti, roasted with vegetables, and many other dishes. In this roasted pumpkin soup you will savor the natural sweetness of the pumpkin that’s coaxed out by the roasting and gently enhanced by spices. And, as with all my recipes, this roasted pumpkin soup is Vegan. 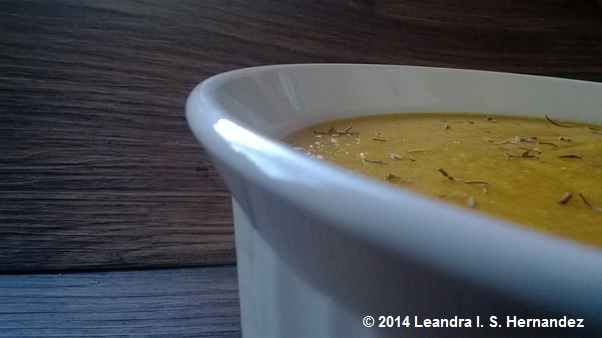 Try my Roasted Pumpkin Soup recipe, you’ll love it! 1 cut of pumpkin about 1 kg in weight (seeded). For ease of roasting, you’ll want to look for a square or rectangular shaped cut. – Carefully remove from the oven and set aside to cool. You will be using all of the roasted pumpkin (except the skin) for the soup. – In a pot, sauté 2 medium onions (roughly chopped), 1 medium carrot (roughly chopped) and 1/4 teaspoon fenugreek seeds (a.k.a mathee seeds) in 2 Tablespoons water stirring occasionally. – Next, carefully scoop out pumpkin and add to soup mixture along with 1 cup of water. It’s okay to add some of the pumpkin that has charred (not burnt) edges as these add great flavour to the soup. Stir well. – Next, add 1 teaspoon Himalayan pink salt, and 250ml of cream alternative. Give a quick stir, cover and let simmer on low heat for 5 minutes. – Carefully remove bay leaf and add soup mixture to blender or food processor. CAUTION: Contents would be hot. Use care.